Sunday dawned greyer and windier than we had hoped, but Marjorie brightened the day with a lovely morning yoga while Sheriff Jim, Maggie and Joan whipped up scrumptious breakfast burritos and bacon! Yum! 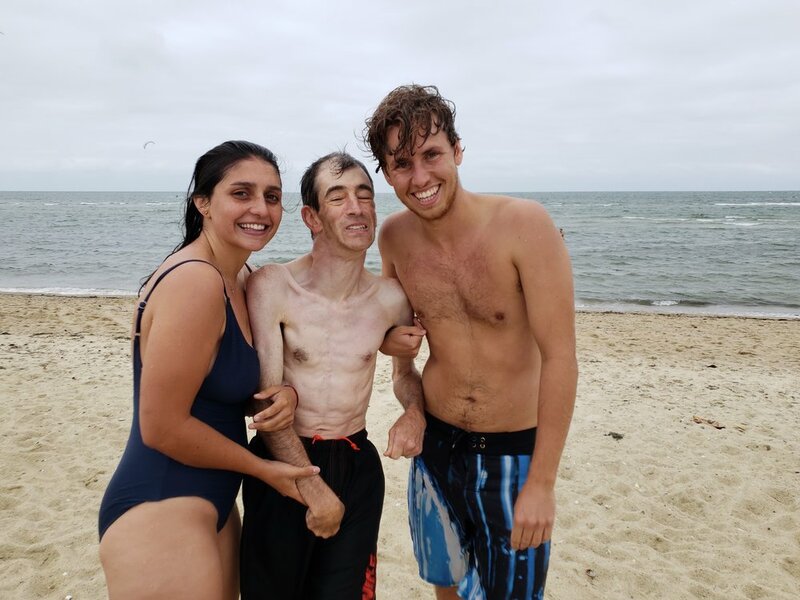 We were determined to fit in one last beach visit, and this time we really wanted to have the whole group there, so after contributions, we packed a picnic lunch and headed to Jetties Beach for a final hurrah. A significant number of brave and hardy folk actually swam and frolicked in the waves (yes, waves at Jetties!) while the rest of us huddled under all of our sweatshirts and towels and admired the folks in the water. We saw people kite surfing and wind surfing which was neat to see, especially on a windy day. While we ate, swarms of seagulls showed overly enthusiastic interest in our food -- it felt a little like we were on the set of an Alfred Hitchcock movie -- but we managed to keep them away. (Kieran squirted them with his water bottle, Adama, Jan and Mike L yelled at them, and we all clutched our sandwiches tightly!) Two groups went biking, which was very relaxing (Thanks, Darcy!) Then we had our group picture taken in the backyard of the house. Some people did print making while some others got manicures and did some drawing. Thanks for a delicious dinner made by Katie’s parents, Anna and John, with Luke's help. After dinner we had a lot of fun watching the videos from the scavenger hunt and the video of the play. The video of the play will be on YouTube soon. Thanks to Katie’s dad, John, and to John Best for learning the camera equipment from the television station so we had great quality taping. Packing, saying good-bye, heading away from Whereowhero Lane - no one's favorite part of camp.